Logging appears to be imminent in this very important forest in Castella near Toolangi, to the east of Melbourne. The Castella coupes are a stronghold for a diversity of species including the threatened greater glider and critically endangered barred galaxias – a small native fish. A blockade has been established to protect these forests. Please call the environment minister and urge her to intervene to protect this forest. Call and ask to leave a message: 03 9637 9504. Toolangi (to the east of Melbourne) is home to the tallest flowering tree on earth – the Mountain Ash. A wet forest home to unique and gorgeous wildlife including Leadbeater’s possum, marsupial gliders, owls, wombats and wallabies. For seven years community and friends of Toolangi have fought long and hard to have our voices heard about the logging of Toolangi State Forests. Join the day of action to protect the forests – 12th of August. You probably have heard about the campaign to create the Great Forest National Park. You may be aware that logging in the Central Highlands, to the east of Melbourne, threatens precious forests and endangered wildlife. This is a great chance to get into these forests to see for yourself what’s going on. Earlier this year we reported on logging that was planned for an area near Toolangi, just north of Healesville. The Tanglefoot picnic ground is the gateway to the amazing Kalatha Giant which is 300- 400 years old, and the start of the wonderful and popular Myrtle Gully Walking Track . Its accessibility and rich ecology has led to it being visited by many thousands of tourists each year. Despite strong local opposition, the logging has been allowed to proceed. Logging can now be seen from Tanglefoot picnic ground in Toolangi. Local campaigners, the Knitting Nannas of Toolangi, have put out a call asking concerned people to call Daniel Andrews. You can ask to leave a short message for the premier, and then explain that you’re upset that this logging is proceeding, that it will impact on threatened species, tourist income, and local recreation opportunities. The office phone number is (03) 96515000. Aidan Kempster has been raising profile about the proposal for the Great Forest National Park through riding the trails and roads of the Central Highlands, VIC. He is offering a guided ride through a section of the Central Highlands on Saturday September 2. Aidan describes it as ‘a free, self-supported day of cycling in Toolangi State Forest. Bring your own bike, repair kit, water, wet weather gear and snacks’. The Tanglefoot Picnic Ground is an iconic area in the heart of the Toolangi Forest to the east of Melbourne – complete with beautiful surrounds, an information stand, picnic tables and a toilet. It is also the gateway to the amazing Kalatha Giant which is 300- 400 years old, and the start of the wonderful and popular Myrtle Gully Walking Track . Its accessibility and rich ecology has led to it being visited by many thousands of tourists each year. But the area behind the picnic ground is now being being logged! Eventually the coupe will cover 51 hectares. This will greatly impact on the general beauty of the area and make it far less attractive to visitors. It will see the needless further destruction of precious native forest. The Great Forest National Park will deliver a secure future for endangered species, has huge potential to safeguard against climate change, and will protect domestic and rural water catchments, a new report shows. In early December, an alliance of Forest conservation groups have released a report outlining the planning and analysis behind the Great Forest National Park proposal. Great Forest National Park. It’s Time. 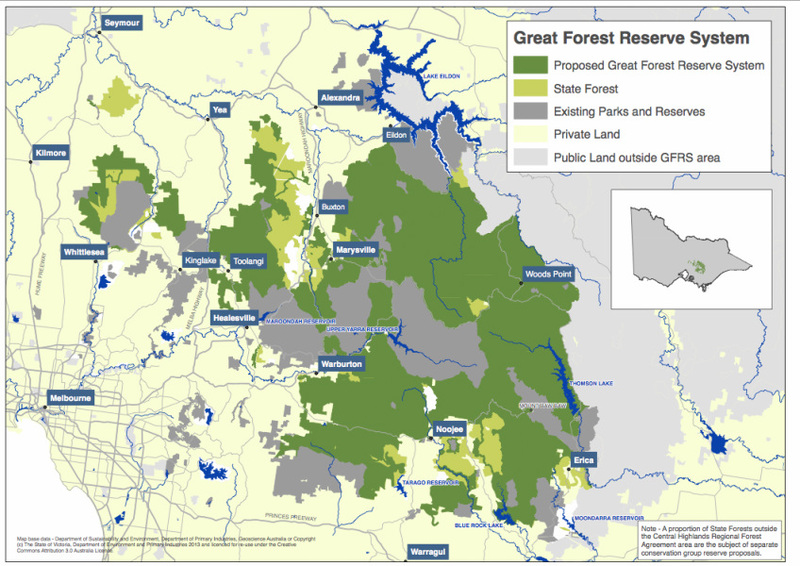 More than 30 environment, conservation, recreation, scientific and citizen science groups representing tens of thousands of Victorians have called on all political parties and candidates in the lead-up to the November 2014 Victorian election to clearly commit to the creation of a new Great Forest National Park in the Central Highlands. Just 60 kilometres east of Melbourne grow some of the tallest trees on Earth. Their high canopies are home to wildlife such as gliders, owls and the tiny Leadbeater’s Possum. The vision for a Great Forests National Park, proposed for the mountains east of Melbourne, is gaining momentum. The Great Forests National Park proposal is a vision for a multi-tiered parks system for bush users and bush lovers alike. The tallest flowering trees on Earth grow north-east of Melbourne. In their high canopies dwell owls, gliders and Leadbeater’s Possum, Victoria’s endangered faunal emblem, that lives only in the ash forests of the Central Highlands. These mountain ash forests have flourished along the Great Divide under rich rainfall patterns. They provide most of Melbourne’s drinking water. They have been shown to be among the most carbon-dense forests on Earth due to the relatively cool climate and rapid growth. The Park, stretching from Kinglake through to the Baw Baws and north-east to Eildon, will protect the forests of the Central Highlands. It will be a world class reserve in Melbourne’s backyard. It is time for this great vision to be turned into a National Park.